Deluxe 3 BR Retreat - Awesome Views - Affordable Prices! You will feel on top of the world in our beautifully furnished Watch Hill condo in Wildernest. Large south-facing windows look over expansive views of Buffalo Mountain, the Ten-Mile Range, and Lake Dillon. Vaulted ceilings give a spacious feel to this two-story unit, and the view from the master bedroom is unsurpassed. The condo is on the second floor-- but don't worry, there are only 12 steps to climb. Three bedrooms provide comfortable sleeping accommodations for 6 adults, with king bed, queen bed, and a new queen with a twin bunk on top for the kids. A twin airbed provides sleeping for an additional person. Each bedroom has its own flat screen cable TV and VCR/DVD. The newly remodeled kitchen is fully equipped for gourmet cooking, and the living room contains an entertainment center with a large screen high definition cable TV, sound bar, DVD player, and High Speed Internet access for your laptop. A large collection of CDs, games, and books is provided for your entertainment, and you can hook your laptop directly to the TV to watch movies. Both bathrooms have been recently remodeled with travertine tile, clear glass doors, and updated fixtures. Free shuttle bus to all Summit County ski areas. Wildernest is ideally situated within 15-30 minutes of all Summit County ski areas, and a shuttle bus provides free service to each area. After a day of skiing or hiking, enjoy watching the sun set over Buffalo Mountain, or relax in one of the three indoor and outdoor hot tubs, located just a short walk from our door. I live in the Front Range north of Denver. I use the 'Schussduck' as a vacation retreat-- a place to get away from it all. I love skiing, hiking, and fishing, all within easy reach of the condo. 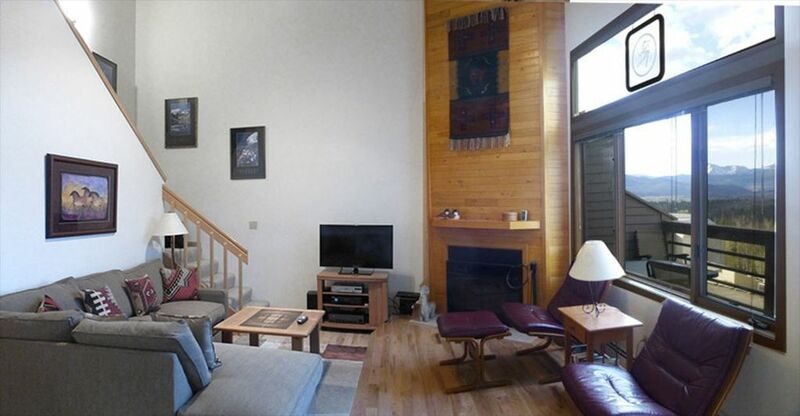 I chose this condo because of its supurb view, its location in Wildernest, and the easy access to free public transportation to all Summit County ski areas. I love watching all the birds that come at our feeder on the balcony-- hummingbirds in the summer and blue jays in the winter. We even occasionally see a moose visiting the beaver pond just below our complex.